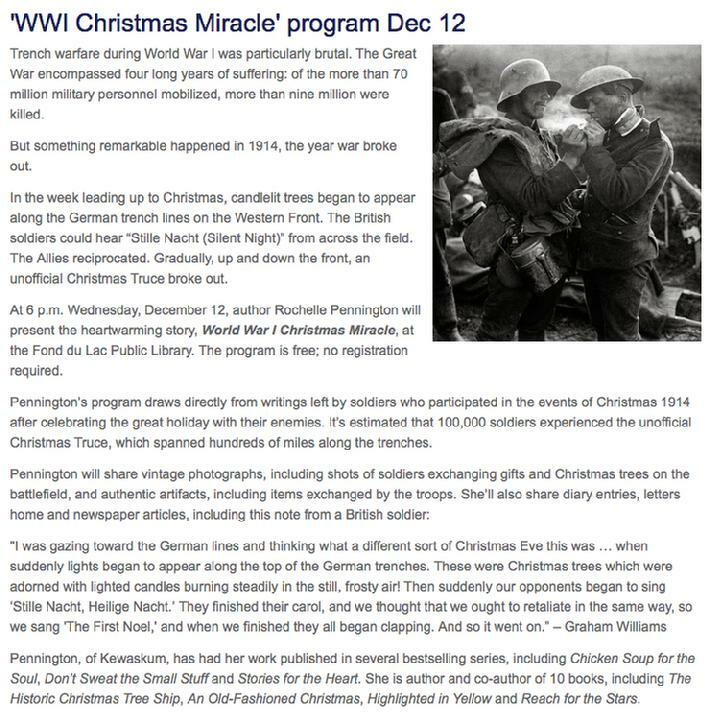 Rochelle Pennington's "World War I Christmas Miracle" program is based on the true story included in her book, Christmas Gifts: Ten of the Greatest Ever Given. Her program draws directly from the written memories of those soldiers who participated in the events of Christmas 1914 while celebrating the great holiday with their "former enemies." It is estimated that 100,000 soldiers experienced the unofficial "Christmas Truce" which spanned hundreds of miles along the trenches of the Western Front in Europe. 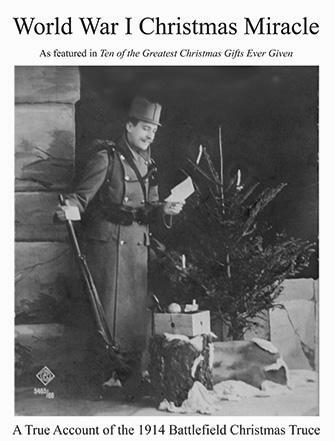 Some truces were initiated by soldiers "gifting" their enemies opposite to them a song, while other truces began when candlelit Christmas trees appeared along the German trenches. In some places the truce was started when brave soldiers appeared unarmed in No Man's Land (the area between the trenches where serving soldiers were dug in for protection). Many truces began on Christmas Eve, while others commenced on Christmas Day. In addition, the author will bring authentic World War I battlefield artifacts with her including items exchanged between the British, Scottish, German, and French troops. "I was gazing toward the German lines and thinking what a different sort of Christmas Eve this was from any I had experienced in the past when suddenly lights began to appear along the top of the German trenches. These were Christmas trees which were adorned with lighted candles burning steadily in the still, frosty air! Other guards had, of course, seen the same thing, and quickly awoke those asleep in the shelters, to 'come and see this thing which had come to pass.' Then suddenly our opponents began to sing 'Stille Nacht, Heilige Nacht' (Silent Night). They finished their carol and we thought that we ought to retaliate in the same way, so we sang 'The First Nowell,' and when we finished they all began clapping. And so it went on. First the Germans would sing one of their carols and then we would sing one of ours, until we started up with 'O Come All Ye Faithful' and the Germans immediately joined in singing the same hymn to the Latin words 'Adeste Fideles.' And I thought, well, this was really a most extraordinary thing - our nations both singing the same carol in the middle of a war." "It was a beautiful moonlit night, frost on the ground, white almost everywhere. And there was a lot of commotion in the German trenches, and there were these lights. Then they sang 'Silent Night' - 'Stille nacht.' I shall never forget it. It was one of the highlights of my life." "I returned to my line to find several of my men listening to the burst of song floating across on the frosty air." The Germans sang, as the Belgian Chaplain Jozef van Ryckeghem remembered, "in voices at first wavering, then firmer, swelling to a mighty Christmas carol." The Germans shouted: "No shoot tonight! Sing tonight! Sing tonight!" "I am sure you are anxious to know how we spent Christmas and I will tell you in detail, but first of all I must describe what will, I believe, live on in history as one of the most remarkable incidents of the war. On Christmas Eve at about 4:00 p.m. we were in a line of advance trenches waiting to be relieved. It was dark when we heard singing and shouting coming from the other trenches at right angles to us. The news filtered down. German and English officers had exchanged compliments and agreed on a truce. Then we started giving one another a concert. We sang every song we could think of. A bonfire was lit and everyone walked about as though it were a picnic." A French officer summed up his thoughts in the simple words: "For an instant, the God of goodwill was once more master of this corner of the earth." Lieutenant Edward Hulse of the 2nd Scots Guards remembered: "The Germans followed with ballads which both sides knew, singing everything from 'Good King Wenceslaus' to 'Auld Lang Syne' which we all knew. Everyone joined in. It was absolutely astounding." "The Scottish soldiers started playing the bagpipes." "Every dugout had its Christmas tree, and from all directions came the sound of rough men's voices singing our exquisite old Christmas songs." "I gazed at the scene all around: the stillness, the stars, and the now dark blue sky. From where I stood I could see our long line of zigzagging trenches and those of the Germans as well. Songs began to float up from various parts of our line." "The singing and playing continued all night, and the next day our fellows paid a visit to the German trenches, and they did likewise." Lance-Corporal Henderson of the Royal Engineers (whose letter was reprinted in The Hampshire Chronicle newspaper) told of the experience: "We discovered a board stuck up in the German trench. We had our glasses on in a minute and read the words in big block letters: CONCERT OVER HERE TONIGHT. ALL BRITISH TROOPS WELCOME." One Belgian soldier's account was printed shortly afterwards in British newspapers: "Christmas in the trenches! It must have been sad, do you say? Well, I am not sorry to have spent it there, and the recollection of it will ever be one of imperishable beauty. At midnight a baritone stood up and in a rich resonant voice sang 'Minuit, Chretiens'. The cannonade roared, and when the hymn finished, applause broke out from our side and from the German trenches! The Germans too were celebrating Christmas and we could hear them singing 200 yards away from us." Robert Graves remembered: "I never heard such applause." "The soldiers were singing. It was unreal, sublime. They were singing: 'Minuit, Chretiens,' 'Adeste Fideles,' 'Les Anges de not Campagnes,' all the songs we used to sing when we were little. The Christmases of long ago were coming to life again, all the things we had known in our childhood, the family, the countryside, the fireside, our eyes dazzled by the tree with its sparkling candles, all the things we now relive in our children." "One starry night nearly a hundred years ago a lonely soldier thought of home, of Christmas, and sang a carol from his trench in a field. His buddies heard and joined in. Across that field their enemies added their voices to the chorus. And all these years later we still have a chance to listen... and to join in." "The beautiful old songs resounded." "Whatever the spirit of Christmas had been before that hour, it was now, above all, the spirit of hope and peace. A British war correspondent reported that later on in the evening the soldiers heard a clear voice singing the beloved French carol, 'O Holy Night.' The singer was a serving soldier, Victor Granier, formerly of the Paris Opera." "For a brief moment, the sound of peace was a carol every soul knew by heart." "It was a truce at which the whole world wondered." The Wurttembergers of the 246th Reserve Regiment of Infantry filed their official report as follows: "Is it possible? Are the French really going to leave us in peace today, Christmas Eve? Then from across the way came the sound of a festive song - a Frenchman was singing a Christmas carol with a marvelous tenor voice. Everyone lay still, listening in the quiet of the night. Is it our imagination or is it maybe meant to lull us into a false sense of security? Or is it in fact the victory of God's love over all human conflict?" "During the past few days you may have read in your papers, or in letters that have actually come from the trenches, as I have, of the marvel of the Christmas Day just past - how in many parts of the firing line there was, by mutual consent, a truce of God; how friend and foe met to exchange some small luxury; how they sang to one another the old Christmas carols and hymns. Is it merely fanciful to say that, on the anniversary of the birth of God's Son, there must have been some gracious influence of the spirit of Christ brooding over the combatants and suggesting, though but for a brief moment, the brotherhood of man in the great family of the Father?" Captain R. J. Armes of the 1st North Staffs wrote to his wife on Christmas Eve 1914: "I have just been through one of the most extraordinary scenes imaginable. Tonight is Christmas Eve and I came up into the trenches this evening for my tour of duty. Firing was going on all the time. Then about seven the firing stopped. I was in my dugout reading a paper, and the mail was being dished out. It was reported that the Germans had lighted their trenches up all along our front. We started calling to one another Christmas wishes. I went out and they shouted 'no shooting' and then somehow the scene became a peaceful one. All our men got out of the trenches and sat on the parapet, and the Germans did the same, and they talked to one another in English and broken English. I got on the top of the trench and talked German and asked them to sing, and they did. Then our men sang quite well and each side clapped and cheered the other." He closed his letter with the words: "I felt I must sit down and write the story of this Christmas Eve before I went to lie down. If I get through this war alive, it will be a Christmas to live in one's memory. One of the German officers I spoke to said that he hopes we shall do the same on New Year's Day, and I said, 'Yes, if I am here.'" The Germans had transported Christmas trees by the thousands to the front lines. These "tiny tannenbaums" were lit on Christmas Eve all along the Western Front and were a key component in initiating the truce in many places. The Regimental History of the 13th London Regiment recorded: "It was the first Christmas of the war and the enemy, no less than ourselves, felt very homesick. The Germans gave the first sign. A tired sentry in our battalion, looking out over the waste toward the German lines spread the exciting news that the enemy's trenches were 'all alight.' He had hardly uttered the words before other sentries took up the cry and we all looked at the enemy's line, which was dotted here and there with clusters of lights. From behind the lines came German voices crying 'English solders, English soldiers, Happy Christmas. Where are your Christmas trees?' And faint but clear, the songs of the season accompanied their voices." The regimental history of the Kensingtons records: "We spent the remainder of Christmas Eve watching the lights flicker and fade on the Christmas trees in the German trenches." Private Frederick W. Heath's recollection, as published in the North Mail newspaper in January 1915, reads: "The night closed in early, and the ghostly shadows that haunted the trenches came to keep us company as we stood to arms. Under a pale moon, one could just see the grave-like rise of ground which marked the German trenches two hundred yards away. Fires in the English lines had died down, and only the squelch of sodden boots in the slushy mud, the whispered orders of the officers, and the moan of the wind broke the silence of the night. The soldiers' Christmas Eve had come at last, and it was hardly the time or place to feel grateful for it. Memory in her shrine kept us in a trance of saddened silence. Back somewhere in England, fires were burning in cozy rooms, and in fancy I heard laughter and the thousand melodies of reunions on Christmas Eve. With my overcoat thick with wet mud, and my hands cracked and sore with the frost, I leaned against the side of the trench, and, looking through my loophole, fixed my weary eyes on the German trenches. Thoughts surged madly in my mind; but they had no sequence, no cohesion. Mostly they were thoughts of home as I had known it through the years. Still looking and dreaming, my eyes caught a flare in the darkness. A light in the enemy's trenches was so rare at that hour that I passed a message down the line. I had hardly spoken when light after light sprang up along the German front. Then, quite near our dugouts, so near as to make me clutch my rifle, I heard a German voice. There was no mistaking it. With ears strained, I listened, and then, all down our line of trenches there came to our ears a greeting unique in war: 'English soldier, English soldier, a merry Christmas, a merry Christmas!' Following those words, there boomed the invitation from those voices: 'Come out, English soldier; come out here to us.'" "I saw that the lights were on a Christmas tree. Farther along the line I could see more Christmas trees sparkling." Hugo Klemm, commenting on the tree lights noted that "as far as the eye could see lighted Christmas trees were appearing to the right and left along the whole sector." "One had to look again and again to believe what was happening." "It was a sight I shall never forget." Carl Muhlegg, a private at Ypernbogen near Langemarck, remembered 50 years later: "I handed the captain the little Christmas tree. He lit the candles and wished his soldiers, the German nation, and the whole world 'Peace according to the message from the angel.'" "You will hardly credit what I am going to tell you, but thousands of our men will be writing home today telling the same strange and wonderful story. Listen. Last night as I sat in my little dugout, writing, my friend came bursting in upon me with the words: 'Bob! Hark at them!' And I listened. From the German trenches came the sound of music and singing. My chum continued: 'They've got Christmas trees all along the top of their trenches! I have never seen such a sight!' I got up to investigate. Climbing the parapet, I saw a sight which I shall remember to my dying day. Right along the whole of the line were hung illuminations of every description, many of them in such positions as to suggest that they were hung upon Christmas trees. And as I stood in wonder, a rousing song came over to us; at first the words were indistinguishable, then, as the song was repeated again and again, we realized what we were listening to. Our boys answered with a cheer. After this we remained the whole night through, singing with the enemy song for song." A regiment from the 2nd Bedfordshires from Britain recalled a German who spoke fluent English coming across No Man's Land in the darkness shouting: "I am a lieutenant! Gentlemen, my life is in your hands, for I am out of my trench and walking toward you. Will one of your officers come out and meet me halfway? I am halfway across now, alone and unarmed. Gentlemen, I am waiting. Will not one of you come out and meet me?" Soldiers reported that their unarmed enemies crawled out of their trenches and "came nearer" causing the warring nations to "meet in the middle." In some areas of the Western Front enemies carried a lit Christmas tree, while in others a white flag was waved. Signs were also hoisted up. One sign simply read: "You no fight. We no fight." "Coming across from the German trenches was a solitary German, carrying a white flag high above his head." Captain Stockwell of the 2nd Welch Fusiliers told of a sign hoisted on Christmas Day at 8:30 a.m. which read "MERRY CHRISTMAS!" The Germans opposite followed with their own sign which read, "THANK YOU!" "'Come halfways' was shouted back and forth. We were walking between the trenches. At any other time this would have been suicide. We shook hands, wished each other a Merry Christmas, and were soon conversing as if we had known each other for years. We were in front of the wire entanglements. Soon most of our company, hearing that I and some others had gone out, followed us. What a sight! Groups of Germans and British extended almost the length of our front. Where they couldn't talk the language of the other they were making themselves understood by signs, and everyone seemed to be getting on nicely. Here we were laughing and chatting with men whom only a few hours ago we were trying to kill." "Up to the afternoon of Christmas Day it was remarkably quiet and then something happened which I shall never forget. I was on guard duty when I saw a Frenchman climbing out of his trench. I had just taken aim when I suddenly noticed that someone had climbed out from our side too. The two of them walked slowly and stealthily towards each other and shook hands. They were followed by several others from their side and ours." "They waved and our men waved back; after all it was Christmas Day. And suddenly the Germans opposite to us and our men were meeting in No Man's Land." "There was no firing, so by degrees each side began gradually showing more of themselves. Can you imagine? Both sides came out, met in the middle, shook hands, wished each other compliments of the season, and had a chat. It was a strange sight between two hostile lines." "One of their officers, a captain, clasped his hands together and looked towards heaven and said, 'My God, why cannot we have peace and let us all go home?'" "We were able to move about for the whole of Christmas Day with absolute freedom. It was a day of peace in war." A Belgian soldier wrote: "Now I am going to tell you something which you will think incredible, but I give you my word that it is true. At dawn the Germans displayed a board over their trenches on which was written 'Happy Christmas'; and then, leaving their trenches, unarmed, they advanced towards us singing and shouting 'Comrades!' No one fired. We also had left our trenches and we exchanged presents. They gave us cigars, and we threw them some chocolate. Thus we passed the morning - unlikely, indeed, but true. I saw it, but I thought I was dreaming. They asked us to spend Christmas without firing, and the whole day passed without any fighting." "The first man I came to was an old man, when we shook hands I thought he was not going to let my hand go. The tears came rolling down his cheeks and I felt so sorry for him as he was so old, and wanted to go home." On January 1, 1915, one of the first newspaper editorials appeared in the South Wales Echo: "When the history of the war is written, one of the episodes which chroniclers will seize upon as one of its most surprising features will undoubtedly be the manner in which the foes celebrated Christmas. How they fraternized in each other's trenches, played football, rode races, held sing-songs, and scrupulously adhered to their unofficial truce. It will certainly go down as one of the greatest surprises of a surprising war." The Scotsman newspaper reported on January 8, 1915: "It was the simple impulse of human souls, drawn together in the face of a common and desperate plight. Those of us who are left at home may well think of the Christmas truce with wonder and thankfulness. The men who kept the truce proved, as men will always prove when the challenge is given with sufficient directness, that the human soul stands out, quite simply, as a thing of infinite goodwill." "It was a Christmas celebration in keeping with the command of 'Peace on Earth.' It is a memory which will stay with us always." "We were strolling about outside the trenches as though there was no war going on." "It was good to see the Germans standing on top of their trenches, and the English also, with caps waving in the air, all cheering." The Scotsmen Lieutenant Kennedy wrote to his loved ones: "For the time being, all the horrors and discomforts of the war seemed to be forgotten. The Christmas spirit was in the air. As we filed out of the trenches that evening, we exchanged Christmas greetings." Rifleman J. Reading wrote a letter written to his wife which was later published in The Bucks Examiner newspaper: "I hope you all had a Merry Christmas. Let me tell you how I spent mine. My company happened to be in the firing line on Christmas Eve and remained there until 6:30 a.m. on Christmas morning. During the early part of the morning the Germans started singing, and shouting, all in good English. They shouted out: 'We will come halfway and you come the other half.' At 4:00 a.m. part of their band played some Christmas carols and Home Sweet Home. You can guess our feelings when we heard that. Later on in the day they came towards us, and our chaps went out to meet them. We did not fire that day, and everything was so quiet that it seemed like a dream." "The silence seemed extraordinary. From all sides birds arrived, and we hardly ever see a bird generally. Later in the day I fed about fifty sparrows outside my dugout, which shows you how complete the silence and quiet was." Lance Corporal Cooper of the 2nd Northamptons wrote the following letter which was later published in The Bedforshire Times and Independent newspaper: "Now what I am going to tell you will be hard to believe, but it is quite true. There was no firing on Christmas Day and the Germans were quite friendly with us. They even came over to our trenches and gave us cigars and cigarettes and chocolate and, of course, we gave them things in return. Now who would believe it if they had not seen it with their own eyes? It is hard enough for us who were there to believe." "Even as I write I can scarcely understand what I have seen and done. This has indeed been a wonderful day." "I left our friends, the Germans, on Christmas Day in a quiet mood and had a final look around." Soldiers from both sides spoke of joint services held to bury the dead bodies lying on the battlefield. Some of these were held in abandoned buildings near the trenches. World War I raged within earshot of nearby villages where church bells were heard ringing at midnight while worshippers gathered to celebrate Christmas Eve mass. "As midnight approached both sides held religious ceremonies to celebrate the holiday and to remember their fallen comrades. Barns behind the trenches were cleared of debris and became makeshift chapels, with wooden tables serving as altars and candles stuck in dusty wine bottles." "It was most wonderful. Chaplain Adams arranged the prayers and the 23rd psalm. Then an interpreter wrote the words out in German. They were read first in English by our Padre and then in German by a boy who was studying for the ministry. It was an extraordinary and most wonderful sight. The Germans formed up on one side, the English on the other, with the officers standing in front, every head bared. Yes, I think it is a sight one will never see again." "They brought the dead man, laid him on the ground, and we all laid a handful of earth upon him and together prayed the Lord's Prayer." "We had fixed up a sort of makeshift altar in a barn. From a nearby village, abandoned and in ruins, we had fetched a few candleholders, a missal, a pyx, and an altar-cloth. The men sang their carols, carols from their villages. Throughout the whole ceremony, the Germans - Bavarian Catholics - did not fire a single shot." "I must say I spent a merrier Christmas in the trenches than I expected. There was a truce for a while so that we could bury our dead, after which we had a short service over the graves. The chaplain read the 23rd Psalm and then the German chaplain read it in German. It seemed odd for us to be lined up on either side of the graves - German on one side and British on the other. After the service the Germans asked if we would not shoot that day or the day after. We were speaking to the Germans and got souvenirs from them. I got a little box of ground coffee so I had coffee for breakfast that morning. We also got nuts, sweets, and chocolate from them. The Germans seem to be well off here. They have plenty of tobacco, and we also got some of it. You will hardly credit this, but it is the truth. Fancy shooting at the enemy and then going over to wish them a Merry Christmas! You would have thought that peace had been declared, as there was no shooting on Christmas Day or the day after. I am enclosing a small piece of ribbon which I got from a German. One of our chaps got a helmet. Remember me to all at home. Wishing you all a Happy New Year." The occupants of the trenches exchanged gifts from the parcels they received for Christmas from their family members. Soldiers swapped everything from cakes and liqueurs to plum puddings and sausages as they celebrated the high holiday of mankind together. French soldiers brought out bottles of wine and champagne, Germans gifted beer and schnapps, while Scots broke open bottles of rum. In addition, the men traded uniform buttons and badges with one another, as well as belt buckles and helmets. These items would later be lasting reminders of the extraordinary moments these men participated in. "We ate their sauerkraut, and they ate our chocolates and cakes." Rifleman A. E. Watts remembered sharing "Christmas pudding, mince pies, almonds and raisins, and red and white wine." Private B. Calder of the 6th Gordons, who wrote a letter to Miss Fuller at a tea shop in St. Loyes, Bedford, said: "I don't think I will ever forget the Christmas Day I spent in the trenches. After the service we were speaking to the Germans and getting souvenirs from them. Fancy shaking hands with the enemy! I suppose you will hardly believe this, but it is the truth." Aidan Liddell of the 93rd Argyle and Sutherland Highlanders wrote to his parents (a letter which was later published in The Hants and Berks Gazette newspaper): "This afternoon the Germans rolled two barrels of beer into our trenches!" "The Germans were shouting, 'Don't shoot. We don't want to fight today. We will send you some beer,' and a barrel was hoisted above the trench and three men started to roll it into the middle of No Man's Land." The 6th Cheshires killed a pig which they found behind their lines and, according to their Regimental History, "cooked it in No Man's Land and shared it with the Germans." "An officer presented our officer with a scarf as a token of gratitude for his care of their wounded. That same evening, a German orderly came to the halfway line and brought a pair of warm, woolly gloves as a present in return. The donor was Major Thomas, who had just received them as a Christmas gift." "Altogether we had a great day with our enemies, and we parted with much handshaking and mutual goodwill." "Unfolding before everyone's eyes on December 25, 1914 was one of the most remarkable events in military history. The men realized this and excitedly wrote home about 'the most incredible Christmas ever.'" When the order was given to start shooting after the truce ended, soldiers refused to fire. Vize-Feldwebel Lange of the XIX Saxon Corps responded to the order: "We can't fire - they are good fellows. We can't." Finally, the commanding officer turned on the men who refused to shoot and said, "Fire, or we do - and not at the enemy!" Not a shot had come from the other side, but at last the men fired, and an answering fire came back, but not a man fell. "We spent that day and the next," remembered Lange, "wasting ammunition in trying to shoot the stars down from the sky." A German newspaper, the Plauener Sonntages-Anzieger, reported that German troops noticed that "the English are shooting randomly into the blue." Lance-Corporal Hender of the Royal Engineers reported on December 26: "This turned out to be another day of peace. About 10 a.m. some German troops came forward and I honestly think they wanted to surrender. They came within hearing distance, and kept shouting, 'Me come with you,' but our officers sent them all back." The British Regiment's Official History records: "A German officer wished to speak to our officer in No Man's Land. On going out, our officer found a very polite and spotless individual awaiting him, who, after an exchange of compliments, informed him that his colonel had given orders for a renewal of hostilities at midday and might the men be warned to 'keep down, please.' The troops were duly warned to keep down, but just before hostilities were due to re-open, a tin was thrown into our company's lines with a piece of paper in it bearing the inscription, 'We shoot to the air.' And, sure enough, at the appointed hour a few vague shots were fired high over the trenches. Then all was quiet again and the unofficial truce continued." On December 27, Major Buchanan-Dunlop wrote to his wife: "Such a curious situation has arisen on our left. The Germans all today have been out of their trenches and had tea with our men halfway between the trenches. They only fire four shots a day. Our men were rather non-plussed (owing to the friendly relations between the two parties) and they couldn't very well take them prisoner. Two of their officers and seventy men even came into our trenches, refusing to return to their own trenches. They insist on staying." "Shells are exchanged for a few hours but every so often we all stand up with no fear of being shot with a bullet." Lance-Corporal Bell of the London Rifle Brigade spent part of December 28, 1914 in what was left of the roof of a bombarded house on sniper duty. He wrote: "Owing to the truce there is nothing to do. We can all see the fraternization going on." On the 30th he commented in his diary: "Truce continues; most amazing. Starting with the 'peace and goodwill' idea on Christmas Day, it was found so mutually pleasant that neither side, though keeping close watch, fires a shot." On December 30, Corporal Bell wrote in his diary: "The German officer opposite expected a visit from a general, and said he would be opening fire between 11:00 and 12:00, and we had better keep our heads down." An "unexpected visitor" (a German soldier with a beer bottle in each hand) showed up in a British trench occupied by the London Rifle Brigade on New Year's Eve hoping to wish his "English friends" a happy new year. Graham Williams, an English soldier who was present, recalled: "We managed to heave him up out of the trench. Then two of us each took hold of his arms and led him back across No Man's Land, and there he was between us, staggering along singing a song at the top of his voice until we reached the German barbed wire where there was a gap which he had obviously come through. I said to the other chap: 'I don't think we'll go any further; if we get into their trench they might want to keep us there.' So we headed the German in the right direction, wished him a Happy New Year, and left him." "It was the most extraordinary celebration of Christmas since those notable goings-on in Bethlehem." A Maryport private was later quoted in The Whitehaven News newspaper: "Christmas in the trenches! What a time! 'Peace on earth, goodwill toward men.' It is hardly to be believed, but nevertheless it is quite true that such was the case this Christmas. Who can realize it? It will astound everyone who hears about it, which everyone will do in good time." "Peace appeared from somewhere, I know not where." "Like a dream, when it was over, men wondered at it." "For the rest of my life, I shall never forget the scene--which goes to show you that human feelings continue to go on even if, in these times, men do not know anything but killing." Kurt Zehmisch of the 134th Saxons reported in his diary: "Christmas, the celebration of love, managed to bring mortal enemies together as friends for a time." Major Murdock McKenzie Wood recalled years later, "I have come to the conclusion that I have held very firmly ever since, that if we had been left to ourselves there would never have been another shot fired. For a fortnight the truce went on. We were on the most friendly terms, and it was only the fact that we were being controlled by others that made it necessary for us to start trying to shoot one another again." 2nd Lieutenant Bruce Bairnsfather concluded: "It was too much to expect that a table would be suddenly wheeled out into No Man's Land, accompanied by English and German diplomats with fountain pens and documents, ready to sign PEACE."